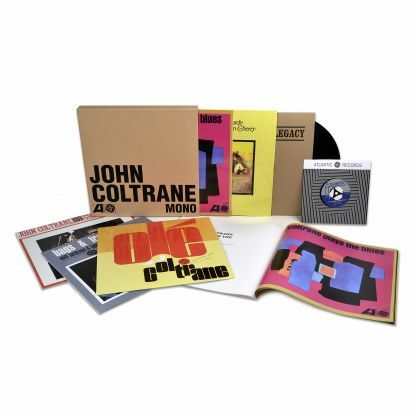 This refreshing Summer six-pack of remastered CDs has been assembled by Rhino Records from what was arguably John Coltrane ’s most interesting and influential period. And if you opt for the vinyl version, there’s also a replica 7in single of My Favourite Things Parts I and II. Authenticity is the idea: everything is in glorious mono, so we can share ‘the same aural experience that greeted fans when these albums were first released.’ Hence no bonus tracks, alternate versions or previously unreleased material, and each CD/LP is sleeved in its original artwork. Giant Steps (released in 1960), Bags & Trane (with Milt Jackson, 1961), Olé Coltrane (1962), Coltrane Plays The Blues (1962), The Avant-Garde (with Don Cherry, 1966), and The Coltrane Legacy (1970). However all of them were recorded between 1959 and 1961, reminding us of the extraordinary richness and variety in Coltrane’s playing during those three years, as well as his exponential growth as a pusher of boundaries. Everyone will have their own favourites. Everything on Giant Steps is iconic. For me, Bags & Trane is a cool and mellow delight, and there’s more of Milt Jackson’s vibes work on The Coltrane Legacy (Centerpiece, Stairway to the Stars and Blues Legacy). Plays The Blues serves as a reminder not only of the central importance of the blues form to jazz, but how it can be made to sound fresh and new in the hands of a master, e.g. on Mr Knight. Olé, which features McCoy Tyner on piano, features the latter’s beautiful ballad Aisha, with Coltrane playing soprano. The Avant-Garde was recorded during Don Cherry’s prolific period with Ornette Coleman. The tracks have more in common with Coleman’s Something Else!! than the wilder shores of Free Jazz. This seems to be Coltrane’s year: a film documentary - Chasin’ Trane - from director John Scheinfeld and producer Spencer Proffer is apparently due for release later this year, with the participation and approval of the Coltrane family; another project - A Love Supreme - is also in the works, courtesy of producer/director Sam Pollard. This film is based on Ashley Kahn’s book about that album, and Khan also supplies the booklet notes to this excellent album collection.